L-R: Brenden van Blerk, GM voco Gold Coast; Paul Donovan, Destination Gold Coast; Gary Baildon, Gold Coast City Councillor; Tom Tate, Mayor Gold Coast; Ruwan Peiris, IHG Australasia; Annaleise Battista, Destination Gold Coast and Paul Salter, SB&G Group. 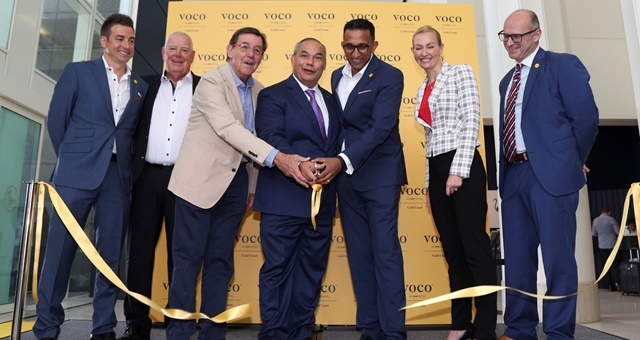 It isn’t often Australia is the scene for a world first, but today the Gold Coast cut the ribbon to signify the official opening at InterContinental Hotels Group’s maiden voco hotel. 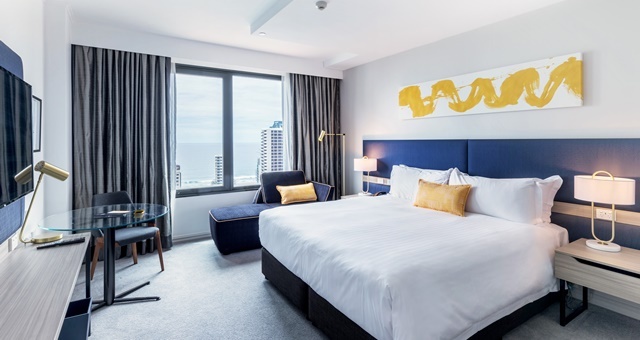 Only a few months after the brand was unveiled, IHG announced the world’s first voco would be on Queensland’s glitter strip in place of the former Watermark Hotel on the edge of Surfers Paradise. The new hotel will begin its integration into the local community through a packed calendar of social events open to visitors, from weekly trivia and high-tea experiences held in its lounge areas. The name voco – inspired by the Latin term meaning ‘to invite’ – is positioned as a modern lifestyle brand catering to equally modern professionals and leisure-seekers, with a strong focus on sustainability and vibrancy. City Mayor Tom Tate and Destination Gold Coast CEO Annaliese Battista joined executives from IHG and its property investment partner SB&G – owner of voco Gold Coast – to formally open the property, which features 389 funky and creatively inspired rooms and suites. In a nod to its sustainability outlook, rooms feature refillable soap dispensers as opposed to disposable bars. Two restaurants – Waves and Clifford’s Grill & Lounge – make up the primary dining offering of voco Gold Coast. In addition, the aptly-named Social House Café has been designed as a contemporary meeting place for guests and visitors to enjoy in their own ways. A Deluxe King Room at the new voco Gold Coast. For all three venues as well as room services, the hotel’s honey supply will come organically via an on-site beehive. Furthermore, all kitchen food scrap will be recycled as part of an initiative with the Gold Coast City Council. Guests can also enjoy two swimming pools, a fitness centre and the L’Aqua Day Spa, while conference planners have 800sq metres of meeting space at hand, coupled with hinterland and ocean views. Voco Gold Coast General Manager Brendan van Blerk said the brand was a perfect fit for the Gold Coast. Two more voco hotels are currently in the pipeline in Australia with voco Melbourne Central and voco Yarra Valley coming in 2020 and 2021 respectively. Globally, IHG is aiming to have 15 voco properties in the pipeline by the end of 2018.